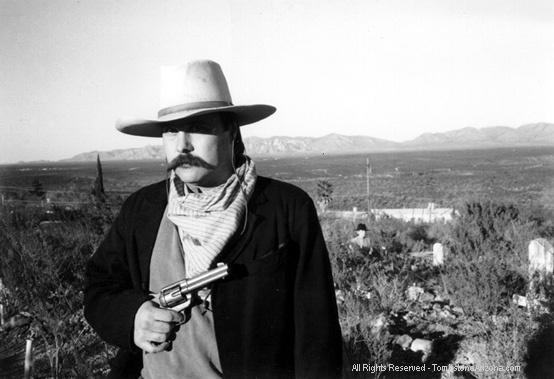 Boothill Graveyard was opened in Tombstone Arizona in 1879. Most of it's occupants suffered violent or un-expected deaths with their boots on, this is the reason why the early pioneers named it Boothill. Some people believe that ghosts are spirits of people that died unexpectedly, violently, and/or at the hands of others, gunfights, hangings, etc. Whether this is your belief or not, PLEASE LET ME WARN YOU...the following photos are not only strange and unexplainable even to paranormal experts, they can be down right scary!! SCARY BOOTHILL PHOTO! This is the photo that changed my opinion about ghost photo's!! 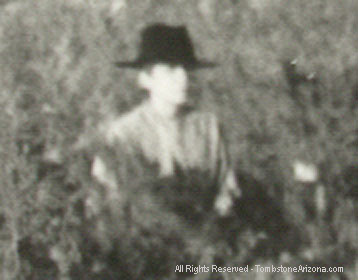 I personally shot this photograph of my friend in Boothill Graveyard... We had it developed at Thrifty Drug Store and no one tampered with it! The picture was shot in black & white, because my friend wanted old west looking pictures of himself dressed up in my 1880 period clothes. All I can say is... "I know their was no other person in this photograph when I shot it, especially some guy holding a knife! Thats right folks, if you look carefully the person in the background appears to be holding a knife!" Look just to the right of my friend and you'll see a person which appears to have no legs or is coming out of a grave! Some people think it looks like a little boy, some say an old man, or even an old lady, what do you think? Interesting facts:.. Boothill Graveyard appears to be really over grown in this photo. Two weeks after this photo was shot we re-staged the photo by lining up two people in both positions. When we did this... you could clearly see the legs of the person standing in the back. The bushes in Boothill are not so thick that you can't see through them. And once again, this IS NOTa staged photo, or designed by the computer, the figure in the background also appears on the negative. I don't know about you... but the blown up image of this unexplained figure holding the knife gives most people the chills!! If you're not convinced that something is weird here, look at my friends shadow in the photo above, it appears to be going back slightly to the right of him. The figure in the back should have the same shadow, but it doesn't! Can you see the knife? We thought this was a tie at first, but after further review, it appears to be a knife! The knife is in a vertical position, the tip is located just below the figures right collar, can you see it? I am purely the "novice" in terms of psychic abilities. However, with age, I find my predicitions and "feelings" becoming more clear and accurate. I rarely share my abilities with anyone other than family and friends, but after viewing this photo, I was compelled to share what I know. I knew right away this photo was genuine and you can be sure the apparition photographed is that of a young man. Much like the opinion posted, I feel the young man is not angry. He's a young man who died of natural causes, perhaps even accidental death. Yet, he's searching. Believe it or not, he's still looking for an animal. It could be a dog or livestock, but I believe it is most likely his horse. He just wants his horse back. in life this man came from Texas (in a hurry) if you know what I mean. Thank you so much for your time. God Bless You. other info other than I assured them that it was not a manufactured picture. psyhics and/or parapsychology groups on the Internet to see what they come up with. ..."Wyatt Earp Murdered My Cousin" signed & numbered collectors audio book giveaways on Twitter! Follow @IkeClanton for your chance to win!